Figure 1.8: Relation of uniform circular motion to sinusoidal motion via Euler's identity (Eq. (1.8)). 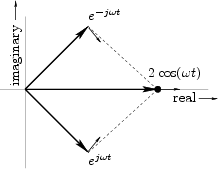 The projection of onto the real axis is , and its projection onto the imaginary axis is . 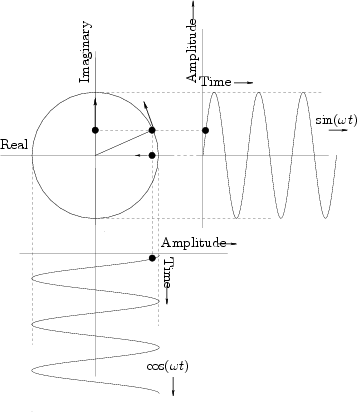 We call a positive-frequency sinusoidal component when , and is the corresponding negative-frequency component. Note that both sine and cosine signals have equal-amplitude positive- and negative-frequency components (see also [83,53]). This happens to be true of every real signal (i.e., non-complex). To see this, recall that every signal can be represented as a sum of complex sinusoids at various frequencies (its Fourier expansion). For the signal to be real, every positive-frequency complex sinusoid must be summed with a negative-frequency sinusoid of equal amplitude. In other words, any counterclockwise circular motion must be matched by an equal and opposite clockwise circular motion in order that the imaginary parts always cancel to yield a real signal (see Fig.1.9). Thus, a real signal always has a magnitude spectrum which is symmetric about 0 Hz. Fourier symmetries such as this are developed more completely in .